During my first trip to Japan, I was feted by business colleagues and treated to a number of unexpected highlights although just why they were unexpected I can't really explain to this day. We had been commanded by our client to "feel" Japan and as part of that process he had taken it upon himself to ensure that we had experienced many facets of life and culture as well as reviewing development projects as we went along. One evening at dinner, a plate of what looked like some kind of flower but which clearly wasn’t, beautifully styled in veneers of petal shaped bits with a slight daub of pink creating a perfect imitation of a lotus flower was placed before me. My guess that this was some sort of fish was pretty close to the mark, and it was evident that this fish had not been subjected to the strange western custom of having been cooked prior to serving, which again should not have been unexpected given my whereabouts. As had become my habit before placing most things in my mouth, I turned to our Japanese colleague for a small hint as to just what it was I was about to consume. 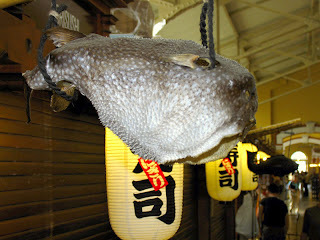 “Ahh”, I thought out loud, “Puffer Fish”- a polite term for what we called the Toadfish when at home. "Isn't that poisonous Wada san?" "So if I eat this and get sick, it will be your fault?" "No. Won't get sick. Very poisonous, you just die. Ohh! Don't worry, " he continued obviously sensing a small wave of distress flooding over me," if you die, then the cook will lose his license." With those words of complete reassurance, and not wishing to offend my host who had gone to some effort not to mention considerable expense to get me a seat in this renowned restaurant, I made my peace with the Lord, and tucked in. As one would expect in these circumstances, the food was a feast of fantastic presentation and texture but it must be said, tasted nothing at all like chicken. If forced to provide a description at all, I'd say it was a moderately passable imitation of raw puffer fish. From the first tiny mouthful, my mind worked overtime, looking for any sign that my mouth was going tingly during the evening. Would I simply pass out? I wondered. Throughout the evening, I tested every nerve ending in my mouth to see if there was any sign of misbehaviour. I rested uneasily that night, and it was only at the dawn of the new day that I was able to satisfy myself that fortunately I remained steadfastly in this world. I had "felt" a little more of Japan and lived to tell the tale.